The dusky pionus parrot is a medium-sized parrot known to have a gentle disposition, making it a good choice for first-time parrot owners and families. And it is a quieter bird than other parrots, making it a good choice for parrot owners living in apartments or condos. This is not a vibrantly colored bird, but its grayish tone is highlighted with subtle but beautiful shades of blue, violet, and pink, as well as flashes of bright red. The dusky pionus parrot is also sometimes known as simply the dusky parrot or the violet pionus. The taxonomical name of the dusky pionus parrot is Pionus fuscus. It is one of several members of the pionus genus, which includes eight species, five of which kept as pets. The dusky pionus parrot has a specialized range in the wild, spreading itself across several parts of South America, including Venezuela, Brazil, Guyana, Suriname, French Guiana, and parts of Columbia. The birds prefer forested areas where they can hide and forage among the foliage and brush, shielded from predators and the elements. Thanks to captive breeding programs and their popularity in the pet trade, dusky pionus parrots can be found living happily as pets in almost every country in the world. The dusky pionus is best described as a medium-sized parrot. As adults, they normally reach a length of between 9 and 10 inches when measured from the head to the tips of the tailfeathers. They have a stocky build and will weigh 7 to 8 ounces at maturity. The dusky pionus parrot, as is true of other types of parrots, can live a very long time in captivity when properly cared for. Most dusky pionus parrots have an average lifespan of 25 years or so, although this varies greatly among individuals. Some individuals have been reported to live upwards of 40 years, so it's very important to be sure that you can commit that sort of time to a pet before bringing this parrot home to live with you. Like others in the pionus parrot group, the dusky pionus has a reputation for being a very quiet, laid-back pet. The dusky pionus parrot enjoys spending time with its family members, so if you are considering this bird, make sure that you'll able to be at home with it for a good portion of each day. While the dusky pionus parrot will sometimes learn to say a word or two, they are not known for being a highly vocal, talking bird. This is not to say, however, that they are difficult to train—pionus parrots in general and the dusky pionus in particular often take well to learning tricks when they are taught using positive techniques that keep the experience fun and engaging for them. The dusky pionus parrot is a dark-colored bird overall, with dark grayish-brown feathers covering most of its body. In proper lighting, however, the true beauty of their plumage pops out. They have brilliant blue tails, accented by blue on the edges of their wings, a speckling of white feathers on their necks, a reddish/pink tinge to their breasts and bellies, and bright red under their tails, like all pionus parrots. There are no obvious visual means of distinguishing males from females. A dusky pionus parrot is generally easier to care for and less demanding than many of the other parrot breeds, but potential owners should still do their homework. This bird will need plenty of room—a large parrot cage or aviary is the best environment, and the more space, the better. They will do fine in a medium-sized parrot cage, but in this case be prepared to give them plenty of exercise time out of the cage. Provided with lots of toys, such as swings, a dusky pionus parrot will keep itself nicely entertained and requires less interaction than other parrots. Still, be prepared to give your bird at least 2 to 3 hours out of the cage each day—more if the bird is in a smaller cage. Provide a playpen or perch in the home for the bird to use during his out-of-cage exercise time. Dusky pionus parrots are particularly fond of swings. The dusky pionus parrot is less likely than other parrots to bond exclusively to one person only, especially if it is socialized with all members of the family at an early age. This species is not known to be a talker, but it can learn to mimic 10 to 20 words with training. Like all parrots, the dusky pionus parrot does best in captivity when it is given the highest quality nutrition. To achieve this, most owners feed their birds a nice commercial seed and pellet mix, supplemented with fresh fruits and vegetables on a daily basis. Doing so will make sure that the bird is exposed to a range of vitamins and minerals that will help support immunity and essential life functions. A varied diet can help keep your parrot happy and entertained, avoiding the boredom and depression that can set in if they eat the same thing every day. Avoid fatty foods, as these birds can be susceptible to obesity. For example, banana chips, loved by many birds, should be avoided with the pionus parrots, because they are fried in fat and can cause the birds to become overweight. Dusky pionus parrots should be encouraged to come out of the cage and exercise for a minimum of 3 or 4 hours each day. This is essential for birds kept in small- to medium-sized cages. Owners should set up a safe, bird-proof area for their bird to play in, and make sure to supervise their birds closely during playtime to prevent accidents and injury. Although it is a relatively healthy species, the dusky pionus parrot is known to be more prone to aspergillosis infection than other species. The main symptom of this infection is heavy, difficult breathing. This fungal infection can be fatal, but good hygiene and an excellent diet are the best preventive measures. A veterinarian may prescribe anti-fungal drugs if your bird is diagnosed with aspergillosis. 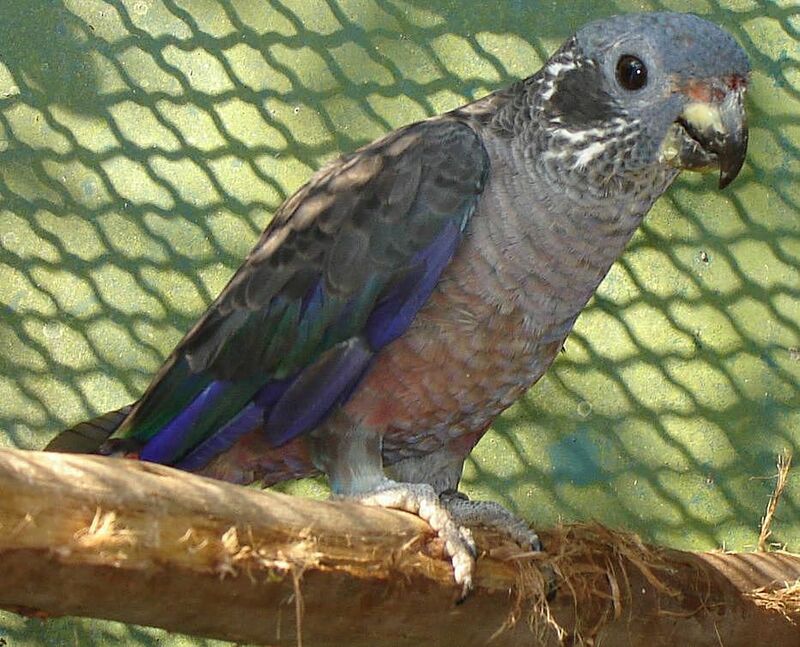 Dusky pionus parrots can also be prone to obesity, especially if confined in smaller cages or if they are not allowed enough out-of-cage exercise time.